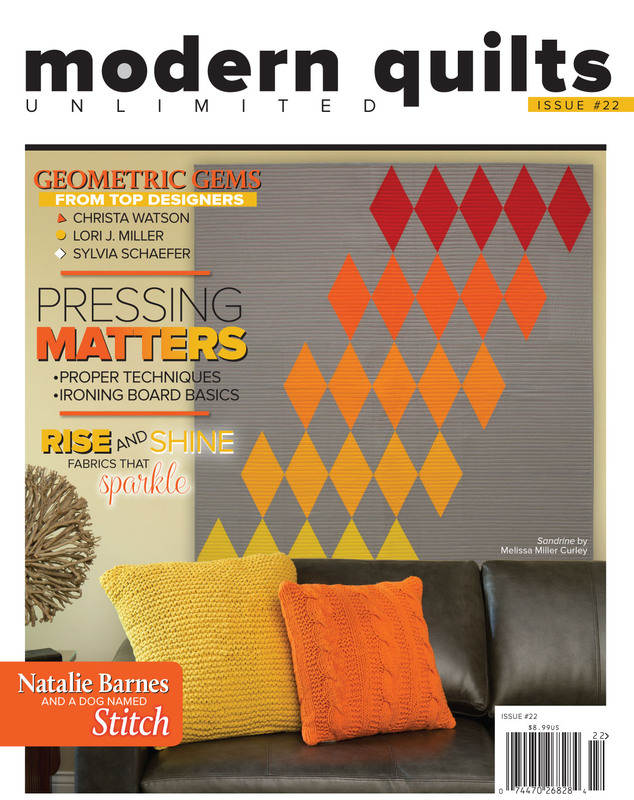 Christa Watson used her Modern Marks prints to create a fantastic quilt featured in issue #22 of Modern Quilts Unlimited magazine. The block looks complicated but is made up of just one simple unit set on point, and then it's all about color placement. 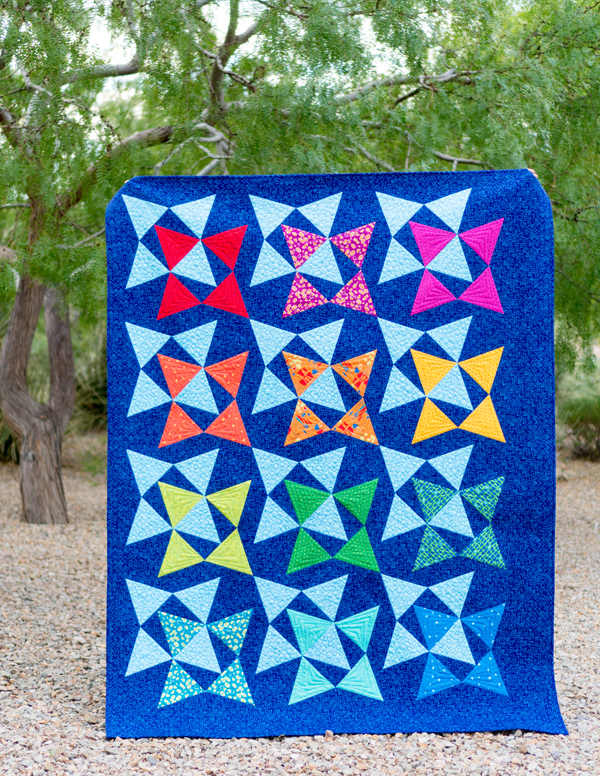 Christa talked to us about Star Shadow and also shared some additional photos of the quilt. 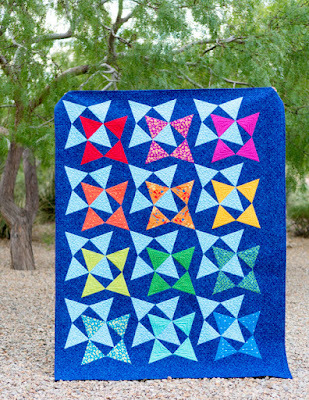 How did you come up with the idea for this quilt? I love working with basic geometric shapes. I’ll decide that I want to work with triangles today and then come up with all the ideas I can that use triangles. I’m always designing dozens of ideas that may not turn into patterns until years down the road. In fact, I had the basic shape for this design before I ever designed the fabric. Once I have an idea I like, I’ll fine tune it. I knew I was onto something with this star shift idea. Tell us about the block. It’s made out of one of my favorite units—a triangle square made using a Tri Recs ruler, with a center triangle and two side rectangles. How did you choose the colors to use? Because I design in EQ8, I can literally swap out the fabric with every single print in the collection. When I tried the navy blue as the background, I thought it looked the best. But even choosing the lighter blue…there are three in Modern Marks, and I had to choose the best one. Then I have twenty-four prints left, and it’s like picking your favorite child. I knew I wanted to showcase twelve, and I had twice that to choose from. What made you decide on a rainbow pattern for the block placement? It was an iteration I tried. 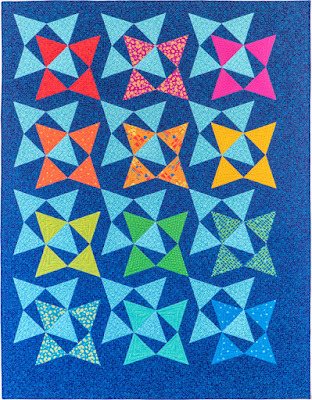 I started with scrappy, and then tried just using three colors—the navy, the light blue, and one color for the stars. Then I tried each row having a different color stars. Eventually I got to rainbow. Tell us about the navy negative space on the right side and bottom of the quilt. The hardest part of this quilt was figuring out how to balance the design since the stars are offset. 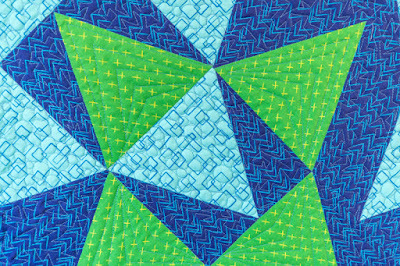 Asymmetrical design is part of modern quilting, and piecing additional rows balanced the quilt. 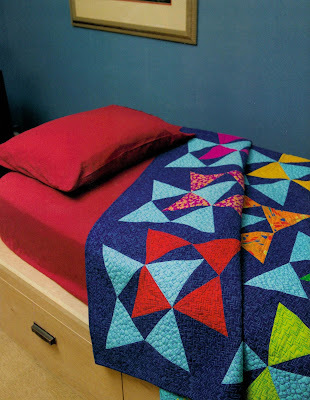 What tip would you give people who are making this quilt? It’s totally okay to work with directional fabrics (like the navy background print) and have them go in different directions. 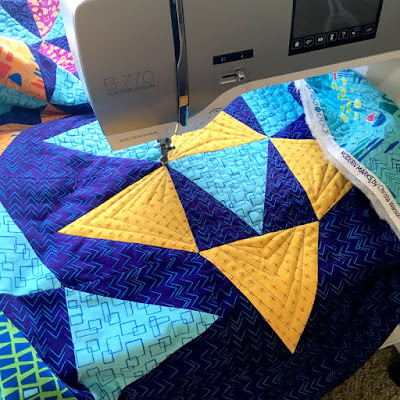 It adds interest to the quilt, and you’ll drive yourself crazy trying to line them up. Probably the machine quilting. It’s very dark and busy, but I had so much fun quilting it. Because my first love is machine quilting, to me it adds a final level of texture. You have to come in for a closer look to see it. Click here to find Modern Quilts Unlimited.